X Company’s creators discuss the heartbreaking finale and look towards Season 3 | TV, eh? War has its casualties, and unfortunately, the X Company team suffered a big one during Wednesday night’s episode. Tom Cummings (Dustin Milligan), the fast-talking former ad man, suffered a fatal fall from Dieppe’s cliffs while fighting off Germans alongside Neil and Harry. Pair that with Aurora and Alfred successfully (it seems) getting Franz Faber to turn against his own country, and X Company delivered a stunning season-ender. We got co-creators Mark Ellis and Stephanie Morgenstern on the phone to talk about it—including some things viewers didn’t see—and where the show goes from here. Stephanie, how did you and Mark come to the conclusion that Season 2 would cover a month-long period ending in Dieppe? Stephanie Morgenstern: We knew from the beginning that we wanted to pick up the split-second we left off from Season 1, to have Alfred and Faber face to face finally and to have the entire team in disarray and the chaos of unforeseeable events landing on them. We wanted to start from a point of maximum disaster, so if we had fast-forwarded a couple of weeks in story time it really would have been a missed opportunity. It’s partly the way we like to write; when the events unfold almost in real-time it just feels like you hit the ground running and you don’t have time to inhale. Let’s talk specifically about the season finale. Within the first few minutes, I was hoping Sabine and Faber would escape Germany. Stephanie Morgenstern: One of the things about elaborating their story this season is that it really is a love story. It’s hard to imagine a more conflicted love story considering the secrets they’ve had to hold onto and I think if people are rooting for them not to be lined up and shot as traitors we’ve done something right. Obviously, we want a whole array of portraits of Germans. Some will be full-on bad guys and some will be conflicted and some will be complete innocents. You had Alfred and Aurora kiss. Why did you decide to do that? Stephanie Morgenstern: It’s something that we talked about for a long, long, long time and also, ‘If they do kiss, what is that like?’ Do we play it straight and let viewers think about what it feels like for a synesthetic man? I think what landed us in favour of finally having them kiss, after a lot of debate, was that I think everyone does want to see it happen. But at the same time we’re confident that it’s the opening of a can of worms rather than the resolution of anything. It’s the beginning of where you go from here and that’s something I think we’re going to have a lot of fun with in Season 3. Mark, let’s talk about the decision to have Tom die. How did you come to that conclusion? Did Dustin Milligan ask to leave? Mark Ellis: There’s a little bit of both. From the very first season, our network executives at CBC have pushed us to put our money where our mouth is when we say that the average like expectancy for an agent in the field is only six weeks. And we have tons of impossible gunfights where Germans die and none of our guys do. [Laughs.] So it felt in some way we needed to bring that authentic layer to the show. We wanted to push the characters that surrounded Tom to a new place that involved not only seeing the devastation at Dieppe but also losing someone close to them. It’s a great springboard for our other characters and will galvanize them, Neil especially, in Season 3. It was a tremendously difficult discussion between the two of us and Dustin. He has family that live in the States and on the west coast, so I think that was part of the decision as well. But if we were ever going to kill a character, we wanted to create an arc that justified that death. We didn’t want a sudden exit. We had a great conversation all season long and even in the table read for that episode, to discover what those final moments would be for Tom. Dustin is a very sharp, very smart actor, and encouraged us to peel away his dialogue and final words and leave him with things unsaid. So, you originally had lines for Tom on the beach? Stephanie Morgenstern: Yeah, we did. We had a longer speech, and then we had a shorter speech and then a couple of lines and then nothing. It just seemed like that would be the most powerful statement to make. This is a life that should have continued, a breath that should have continued. Mark Ellis: It underlines the agony for all of us, and for Harry and Neil especially. Stephanie Morgenstern: But then we had the letter delivered to Camp X two days later and Krystina was able to share it with Sinclair. Mark Ellis: We had a lot of debate over that as well as to whether we would hear Tom’s words in his voice as Krystina read the letter and we played with the sound mix a lot and decided this was the way to go. Tom’s death was immediately followed by the young German soldier collecting the dog tags of his fallen comrades. Stephanie Morgenstern: We’d known for awhile that this would be the breaking point for Harry, that he would take it out on this sort of doppelgänger of himself. We even gave him Harry glasses. By the end of the episode Faber has presented himself to the team and offered his services. That was another shocking moment. Mark Ellis: We wanted to marry the scene from earlier in the series where Faber is face-to-face with Alfred. We weren’t sure whether he would turn or not but we knew there would be a showdown. I don’t think we can know for sure whether he’s turned or not until we see things play out in Season 3. Where do we go from here? What can you say about Season 3? Mark Ellis: Whether Faber turns or not is the central question to Season 3. We’re interested in creating some great scenes with Sinclair and Faber. Hugh Dillon is such a great actor and he’s delivered a huge season for us and we want to keep pushing that role. But we should never feel certain that Faber is on our side. Faber isn’t headed for Camp X? Mark Ellis: He is staying in Europe. Is Sinclair headed to Europe then? Mark Ellis: I think it’s too much fun for him not to do that. What’s the situation with Scuba Man? Will he be back? Stephanie Morgenstern: Now that Faber is potentially on our side, we do need a major new threat and we have something up our sleeve that we’re very excited about. Mark Ellis: There are two new characters that we’re imagining that are going to scare the pants off you. 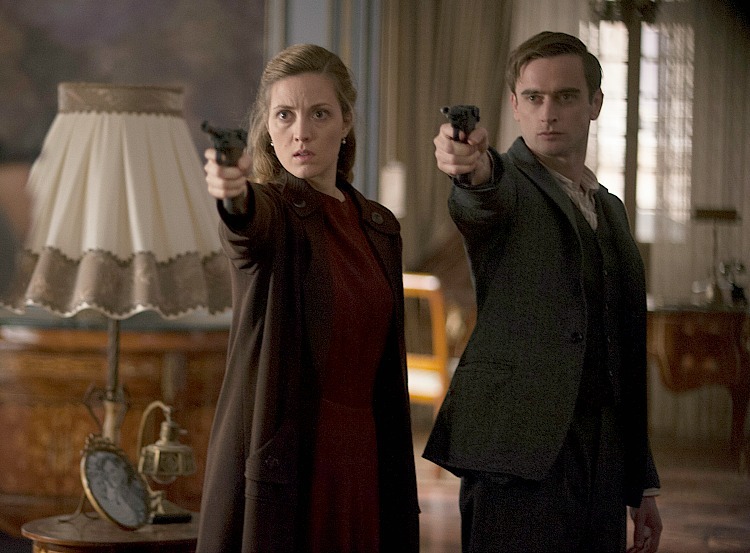 What did you think of X Company‘s season finale? What do you want to see happen in Season 3? Comment below or via Twitter @tv_eh. Yes, sad though the end was, it was getting a bit ridiculous to have only the enemy and the “common foot soldiers die” while the team remained intact. I have a very elderly friend who was in the Resistance in Normandy as a man as young as Harry and that German lad, and the mortality rate was very high. Yes, I get the impression that Faber is still playing for time – he realises that there are evil things about the Nazi régime, but betraying his country and comrades would be a huge step for a military officer. And we don’t see where Sabine is, or whether she is safe. Yes, no idea whether Miri is alive or dead, on the run or in a death camp as a “damned Gypsy” and partisan. Did we see Mme le professeur Katz (Jacob’s mum) on a transport east to death camps, or did I imagine that? I was at Dieppe almost 30 years ago and indeed it seemed like a terrible place to stage an invasion, with the big cliff behind the pebble beach, where troops arriving could be picked off. Spent the night grinding the crap out of my teeth in my sleep. Can I send you my dental bills? Seriously though, I come away from this show every week with a bit of a sick feeling in my stomach. It’s not just fiction and as much as I want to tell myself that it’s just a tv show, I KNOW that there were so many young men and women who lived a real version of this and I just can’t imagine how anyone comes out of a war zone being able to function in a normal way ever again. Superb acting and storytelling. This series should be “required viewing” to remind us what our freedom cost. Such a good comment. You are right and I see a growing awareness in our schools to get the students involved in researching what the military action was like by interviewing the few remaining soldiers. In our city, one group of high school students did a year-long project and published a book. Captivating program. Waiting for the next season will not be easy! Great finale. Faber’s breakdown moved me to tears. Interested to see where it goes from here. While Faber could be a great asset, he is also a war criminal for his executions in the village. I was surprised withTom dying. I think that Franz Faber and Sabine work together as a self directed underground partisan two some. Faber will play both sides, A Nazi high ranking officer pretender and a information gatherer and sender for the Canadian Spy group. Sabine will be the messanger, she may be sent to Camp X for training and her own security. She will deliver the messages from her husband and they will be radio transmited to the Harry. This is the deal. Neil infiltrates as a Nazi into some concentration camps to photograph and send back as avidence . Alfred will marry Aurora and then he too will go along as a Nazi and work with Faber. He will be decoding messages from the Furer and the high ups. Harry will be in the field with Aurora, they will be sent into a concentration camp and will find a way to survive and send out messages too. Faber will somehow perfect them for they hold Sabine’s life and his double sided behaviour over his head. This is the best writing and acting on tv. I purchased the year 1 DVD and preordered the second year. We need a playlist for our X-Company friends and their comrades in arms. Starting out with one of the partisan songs by Anna Marly https://www.youtube.com/watch?v=wZIDTHYmxcg Though Canadians even of the anglo variety ;-) might remember Leonard Cohen’s version of this. I like “l’ennemi était chez moi” much better than Cohen’s “les Allemands étaient chez moi” because a) the first victims of the Nazis were Germans and b) there were many collabos everywhere. I also like the bittersweet bit at the end. Very sad that Tom has died. Someone was obviously going to die knowing what happened at Dieppe. The trailer pretty much sold it out as Tom due to his absence in the safehouse and warnings from Neil… but the exit was quite spectacular! The finest Canadian show I have ever watched. Bravo!!!! The acting was superb, the writing (for both seasons) exceptional. Each episode a hand wringer until the very end. It was hard waiting for the next episode every week. Bring on season 3, we’re all waiting. This is the best show CBC has ever aired. The anticipation from week to week was high. The actors are so outstanding and the writing is good, the hour seemed to go too fast. I’ve been to the beaches in Dieppe and spoke with many of the survivors so it really hits home with me. Yes, as I’d written above, I spent a few days exploring Dieppe and its surroundings with a friend who was in the Resistance in Normandy as a very young man (think Harry’s age) and who is still alive, but of course very elderly. This was 30 years ago, so he was much younger and recently retired – up to long walks and treks up the winding routes up those cliffs. I also have a friend a few years younger who had to wear the yellow star as a little (Italian) Jewish girl in Paris. Her family’s lives were saved by an Italian civil servant, nominally fascist. Lagatta knows enough about the good and bad of Italian culture to suspect that while he was outraged about the Nazi’s cruelty, hands were also greased… My friend is still alive and well, in her 80s. She spent her professional life as a professor of Italian in Paris, and can not tolerate any form of racism or bigotry. I wrote a long comment about the show, historical issues and films about the Vél d’Hiv round-up and the Romani genocide, but the site seemed to think it was spam. As I’d successfully posted a comment that included URLs of music of the period, I have no idea why: I had posted Wikipedia references to the films “La Rafle/The Round Up” about Vél d’Hiv and “Kokoro” about the Romani genocide, or Porajmos, as well as the URL of Canadian journalist and documentarian Karl Nerenberg’s documentary about continuing mistreatment of Romani people in Central Europe, “Never Come Back”. Anyone interested can find these online. Never Come Back is a freely accessible youtube video. A fantastic show. I, too, waited anxiously all week for the next episode and was SO RELIEVED to hear it’s been renewed for Season 3. Great actors. Great writing. Great story. This is the best show CBC has ever done: well-written, well-acted, well-directed. I am so glad that the audience learns some history mixed in with the fiction, and stunned to see a German portrayed as a genuine conflicted human being. Bravo, can’t wait for next season! I like this show, but now Tom’s dead. I’m not watching it any longer. Killing the kid would have been better. I can’t stand him. But Tom was a much better character… and his death meant the death of the show for me. I’m done. I suspect “the kid” will grow up if he survives the coming season. Very young people involved in causes often become fanatical about them – and not just those in the Nazi youth. With a little more life experience he’d have understood that his young German counterpart was a conscript who had no other choice, especially under a totalitarian régime (conscientious objectors were forced to clean minefields, where they were eventually blown up, among other things). Odd, I didn’t like Tom at first; I found him smarmy and a bit of a prequel to Mad Men. But he certainly became a fully-fleshed character and had to undergo quite the ordeal even pretending to be seriously wounded and then finally falling over the proverbial cliff. I miss René, who looks like a friend of mine (who is considerably younger than I am), but that wouldn’t have allowed me to watch much of the series. I do appreciate the development of the women characters. Some commenters are saying that it wasn’t realistic in light of female roles 70 years ago, but the very fact that so many men were off fighting meant that women had to take on new responsibilities (as we see at Camp X). And that was certainly the case in the Resistance, in many countries. A great tv. show but set in France and made by bi-lingual Canada and yet no French speaking actors? My French Canadian great grandfather fought and died in that war and I’m disappointed that there is a lot of German being heard but no French. Molly, I agree. There were two Francophone Canadians among the leads (not to mention actors from France); Aurora and René were both journalists from Montréal and played (in English) by prominent Québec actors. What annoyed me was that the convention was that they always spoke English to each other, not only in group situations where (alas) English would have dominate back then but also in intimate conversations and in dealings with locals in France. Even when René died, the last words were uttered in English, which was ludicrous. (A realistic situation would have had them not only speaking French but reverting to a somewhat more “local” Québec type of French – though keep in mind that these were educated speakers; it would have been more subtle than having them speak a type of “joual” that audiences in Europe would struggle to understand. Alas I fear that those conventions were to prevent the anglo audience from complaining that there was “too much French”, as even among the anglophone cast members, most were supposedly bilingual or trilingual (German) and would have spoken to the French nationals in French. Jacob and Mme le Professeur Katz (his mum) would have also been speaking French. I’m looking forward to a French language version of X Company! As an American former combat photojournalist I usually avoid various combat series. But this one is just riveting. It’s so well acted and emotionally layered that I find myself comparing it to Anthony Doerr’s brilliant WW2 best seller “All the Light We Cannot See.” Both that book and this series capture a certain time beautifully and reminds us of the terrible consequences of war, on boh sides. Thank you for making great television. PS please don’t kill off Alfred, Aurora or Neil. For various reasons, they all need a break! see this series ending following season 3. I thing there will be a season 4 as well.